Ask The Bellwether: What Workshops Do You Teach? What Workshops Do You Teach? I teach a wide variety of classes at my local yarn store and area guilds, shows and workshops. I am happy to tailor a workshop to your group: perhaps you want a sock-blend drum carding class followed by a sock yarn spindling class. Or a fiber dyeing class instead of yarn dyeing. Let's talk! Background: I "fell" into spinning when a house purchase included two llamas. Since then, spindles of all sorts invade my bookshelves, and there are wheels and charkas in every spare nook. Spindling: The Basics is my first book, and I am having a blast with my blog and teaching workshops. You can find me on ravelry, flickr, and blogger as askthebellwether, on youTube and LiveJournal as thebellwether, and by my real name, Amelia Garripoli (nee Carlson, if you go back into the archives) on various Yahoo groups. I sell a wide variety of spindles, amazing batts and rovings, and more on TheBellwether.biz, and my young daughter and I sell our handspun and gadgets on ByOurHands.etsy.com. Program fees: cost is $30/student per workshop plus materials and travel for most programs, which are 2-3 hours in length; group rates are available, typical workshop size is 2-15 participants. Day long programs are $50/student plus materials and travel. Presentations are 1-2 hours to any size audience, for a flat cost of $80 plus travel. Expanded day-long versions of most topics are available, with more in-depth exploration are an additional $20 per student. Or, combine 2 topics for a day-long workshop, 4 for a weekend retreat. Private classes are $20/hour, in my spinning studio. For a complete list of materials, experience and equipment needed, and more in-depth description of each class, please contact me if there's no link to the full description here. Description: Top whorl spindling for beginners. You'll be spindling and plying by the end of the class. Description: Drop spindling for spindlers -- techniques for speed, plying, top and bottom whorl, Turkish, Mid-whorl, Balkan, and more specialty spindles. 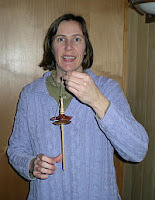 Description: Rediscover a joy of spindling, learning methods to increase your spindle enjoyment and results. We learn a variety of top whorl tricks, bottom whorl tricks, and handy techniques to get more out of your spindling. Description: Learn techniques to spin fine yarns from exotic fibers -- camel, cashmere, yak and more will be spun on lightweight top whorl and Akha spindles. Methods to spin the finest yarns will be covered, as well as plying fine yarns. Description: Learn to spin cotton the way the traditional Akha people do, on their Akha spindles. They use support spindle and top whorl spindle methods for ease and speed. We'll cover their methods of spinning singles and plying, and learn about their unique walk-while-spindling support spindle methods. Description: Navajo, Ahka, Tahkli, Russian ... travel the world without leaving your chair! Learn traditional spindling techniques and fibers on each, each has their own culture, uses and methods. Description: A presentation of myriad spindle techniques with discussion of their place in history, around the globe, what they're used to spin, and how they all inter-relate. Program: You Wove A Hat? Description: Weave a hat on a cardboard tear-away frame in an evening. This is fun and great for leftover handspun, novelty yarn, or a dedicated project. No knitting or weaving skills required. 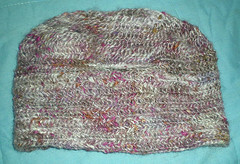 The hat is a tam or beret style hat, and can also be felted down to make a fun fruit bowl. Description: Learn to weave on the rigid heddle loom, creating a scarf with 6-8 ounces of yarn. This class is a day-long class. Description: You will learn the basic looping stitches of Nalbinding and their use in creating a hat. We'll discuss its place in history and use in the world today. Description: Have you heard of nalbinding? Use this technique to edge and embellish a knit or woven garment. You'll walk away with knowledge of the history of nalbinding and a new skill you can do with yarn you already have! Description: Learn to needlefelt a flat design that can be turned into a brooch, badge or pin. For beginning and experienced needlefelters. We'll discuss fibers, design, texture, and finish. Description: Make a lovely piece of silk "felt" using silk and fusion material. The fabric can be used in many places ~ quilts, book covers, notecards, lampshades, vests and more. A great way to approach this lustrous fiber! Description: a weekend or long-day program from scratch to plying on a wheel. Includes handcarding and combing, spinning singles and plying on a wheel. Participants need to have a wheel. Description: Have a handle on your spinning and want to take it up a notch? Explore ratio, wraps per inch, twists per inch, crimp, grist, worsted and woolen, repeatable yarn and correcting yarn. Description: Looking for some new ways to twist your fiber? This will have you plying up a storm of new creations in no time! We'll ply our way through Navajo ply, cable, boucle, plying with thread, coil, snarl, beehive, diamond and more. Description: play with color in singles and in 2-ply: we'll create rainbows of color with a variety of techniques for mixing solid rovings and for getting the most out of space-dyed roving. Learn about nub yarn, candystripe, faux cable, self-striping, coils, fractal plying, exploring plying colors. Description: We'll spin the slippery stuff -- fibers without wool scales to help them hold together. Silk, bamboo, alpaca, mohair -- Join me to explore some really "out there" spinning fibers ... with a life vest on! Description: Learn techniques to take you beyond laceweight; make your wheel do the work, explore fiber handling and plying techniques. Description: Learn how to spin a great sock yarn: we'll tune our wheels for socks, pick fibers, spinning style, and plying methods, and play with color. Discuss knitting with handspun vs. commercial sock yarns. Explore the world of spinning sock yarns! Description: Explore the world of created yarns ... from designing blends to designing art yarns, we'll have a go at garnetting, nubs, loops, inclusions, beads, batts, swirls, and more. Bring yarns you'd like to copy and topics you'd like to try out! Description: Boucle, the pinnacle of a spinner's repertoire. We'll do a boucle entirely from handspun (no thread!) then move on to simple boucle, fuzz boucle, coil boucle, and even Navajo boucle. Who knew there were so many boucles?! Description: Let's teach our wheels how to spin soft singles. From laceweight to bulky, we'll pick fibers, tune our wheels, and spin! Woolen spinning and long draw will be explored, and how to finish skeins for non-biasing knitting. Description: Bring your drum carder and learn how to make terrific batts and roving for your next spinning or felting project. We’ll start with basic drum carding of a clean batt of wool, then move on to fiber blends, color blends, texture blends, and self-striping batts. Let's get batty! Description: Learn the techniques and appropriate fibers for each of these hand-processing tools. Combing fibers for worsted spinning, flicking for spinning from the lock, and handcarding for woolen spinning. Then take it a step further with variations and blending techniques. Description: Turn 3 colors into 6 with this fun dye method. Dye wool or wool blend roving or yarn with acid-mordanted dyes. Description: Have fun turning undyed or pale solid colored sock yarns into interesting self-striping sock yarns. Fair-isle and striping dye techniques are covered with microwave dyeing using acid-mordanted dyes. Description: Turn ho-hum into yum, with overdyeing. Take fiber, yarn, or a knit tube in a color you aren't fond of, and jazz it up with overdyeing. Works best on light colors. Microwave dyeing using acid-mordanted dyes. Description: Create fun effects in yarn, pool color on purpose, and just plain play with color -- come dye with me! Microwave dyeing using acid-mordanted dyes. Description: Become your own Matisse -- dye a tube of sock yarn and watch it metamorphose into art when it's reknit into socks. Microwave dyeing using acid-mordanted dyes. Description: A demonstration of sock machines -- a sock is created while the history of the machines and the techniques used are discussed. Description: A workshop for those with sock machines, to get them up and started with a basic mock-rib sock. No ribber needed. This can be tailored to the class's experience level -- we can go on to explore hems, ribbed socks, argyles, mittens, lace patterns, i-pod pouches, or more. Description: Get the most out of your ribber, we'll learn how to do cuffs, legs, cleanly transition to heels, and the top of the foot. Whew! I know, that's alot of workshops ... What can I say, I like variety ;-) And some of these are taught much more often than others, as interest in the topic comes about in the venues I've submitted applications to teach. I'm happy to do individual instruction on pretty much any topic, even more than are here -- spinning on a charkha, washing fleece, knitting, warping a loom ~ so if you don't see a topic you are interested in pursuing here, feel free to ask!